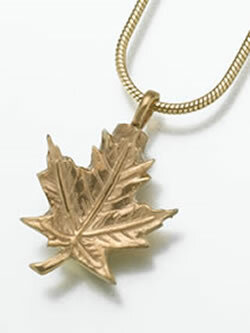 The Maple Leaf Keepsake Urn is available in Sterling Silver or Gold Vermeil. The Maple Leaf measures 1" tall x 1" wide. A screw top opening allows ashes to be added. In order to avoid tarnishing, a layer of silicone is applied to each pendant. A small funnel, filling instructions, care card, and black velvet gift box are included.